I think one of the signs that you’ve officially become an adult is that comfort and safety becoming more important than looking good. Or maybe it’s that embarrassment doesn’t enter the equation as frequently as it does when you’re a teenager. Or maybe, that’s just me. I’ve never exactly had what you might call an impeccable sense of style — and I’ve never been much for make up or getting dressed up — but ten years ago, my priority was looking good. Ten years ago, I would have scoffed at my safari-hat wearing fellow hikers and I would have sworn I’d never let myself look that ridiculous. But yesterday, I found myself enthusiastically wearing my brand new Costco Safari Hat. It offers 50 SPF and protects from UV rays! It keeps the sun out of my eyes and prevents premature aging! It makes me look like one of those ridiculous American tourists in Rome (the kind the whole world makes fun of) and I don’t care! I guess now I just need to get a fanny pack and matching khaki shorts. ***Also, I’m researching Autumn hiking trails within one hour of Northern Virginia and would love to hear fellow bloggers’ suggestions. Any good hikes you know about in the inner/out suburbs or SNP/GWNF? Any input would be appreciated!!! 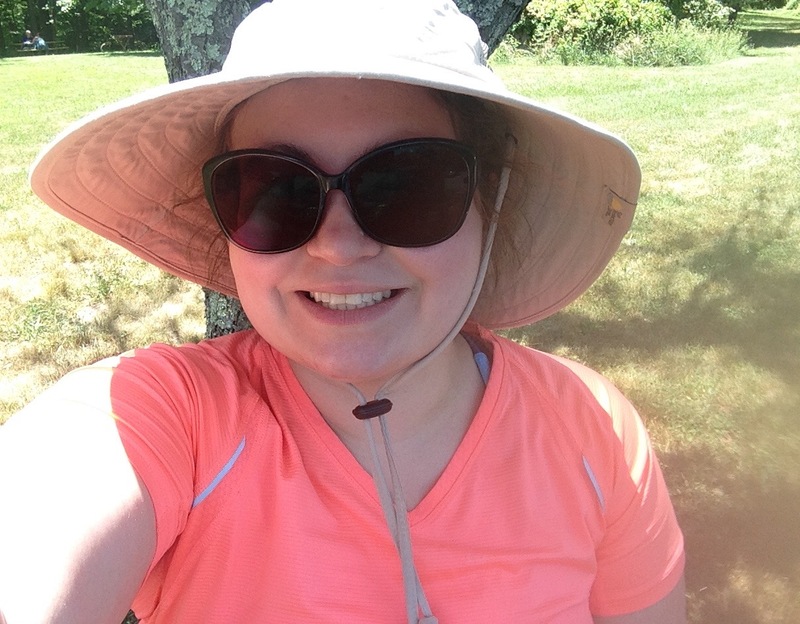 My ridiculous sunhat, moisture whisking salmon-colored hiking shirt and giant, bug-eye, prescription, UV Ray-protecting super sunglasses. It’s not easy looking this good.